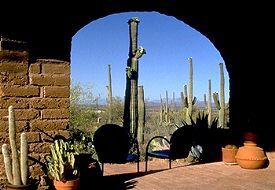 Casa Tierra is located on five acres of beautiful Sonoran desert west of Tucson and only minutes from the Desert Museum, Old Tucson and the Saguaro National Park. 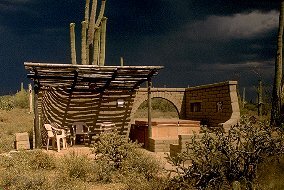 This secluded area features hundreds of Saguaro cacti, spectacular mountain views and brilliant sunsets. With vaulted brick ceilings, an interior arched courtyard with fountain and Mexican furnishings, the rusticly elegant adobe home recalls haciendas found in Old Mexico. Each of the four guest rooms has a private bath, queen size bed as well as a private patio or porch and entrance that overlooks the desert landscape. A two-bedroom suite is also available. After a day of hiking or birding, come relax in the hot tub and watch the sun set, the moon rise and the stars fall. Rates: Aug 1 - June 31 $135-300. Two night minimum. No smoking. Full gourmet vegetarian breakfast. Romantic Country Inns, Getaways and B&Bs offer a great Tucson lodging alternative to big hotels.